What do you do with an Email Once you’ve Read and Processed it? First, that’s a good question. I’m a big fan of INBOX zero so I do strongly suggest moving your processed INBOX email out of that folder. See my comment below about were to put it. Having said that, I don’t think you need to be compelled to clean out your unimportant folders. SaneLater zero just doesn’t have the same zing. So… file into large bins. Don’t file by any criteria that you can easily search for. So… file into an”Archive” folder or “SalesLeads”, “Receipts” (or something else equally large.) SaneBox archives into a single existing Archive folder or if none exists we create a folder called SaneArchive. Don’t delete email unless it has a large attachment that you have on disk somewhere else. Or you are in one of those awful threads where people keep emailing you versions of word documents. In that case, the originator of that email is causing a huge configuration management issue by creating a zillion versions of the same document held in a zillion email accounts. So, you are welcome to delete the old ones. Word should already have the edit history in it internally so the latest version is the one to keep. Disk is cheap and memory is fragile so don’t delete your email. 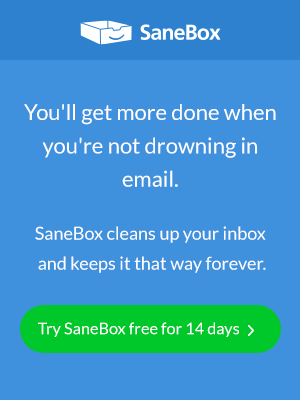 SaneBox will automatically cycle your oldest emails into SaneArchive for you so no need to do that manually. We leave your latest 5000 emails in your Sane folders and move the rest to SaneArchive. Think of that as your attic (but an attic you can search using key words). And I do find that many users just let the SaneLater stuff build up and get cycled into SaneArchive. That does seem to be the most energy and time efficient mode. When you get the email summary digest each day feel free to click“Archive All” if you want to make that process go faster.